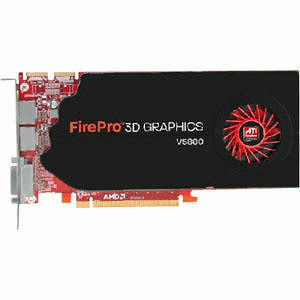 Introducing the ATI FirePro V5800 workstations graphics card from AMD. This mid-range workstation solution featuring ATI Eyefinity technology1 and 1GB of ultra high speed GDDR5 memory and more than double the computational power of previous-generation products.2 It is an excellent combination of price and performance. The ATI FirePro V5800 is ideally suited for CAD and DCC users who work with medium to large models. The native 30-bit display pipeline in the GPU provides accurate color reproduction and superior visual quality.